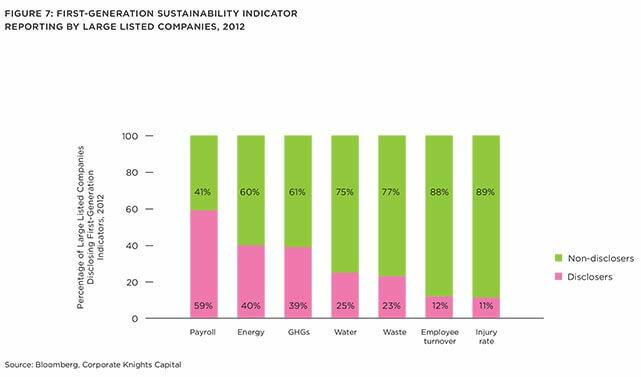 Despite the notable progress made in corporate sustainability reporting, there is still much room for improvement. Last September, the Rockefeller Brothers Fund announced its pledge to divest its fossil fuel holdings as part of a larger divestment movement that aims to deprive the industry of up to $50 billion (U.S.). Later that month, the Montreal Carbon Pledge was launched where investors commit to measure and publicly disclose the carbon footprint of their investment portfolios on an annual basis. To date, investors representing assets under management of $1.2 trillion have committed to the pledge. Add to the above fact that there is currently about $45 trillion of assets under management by 1,314 United Nations Principles for Responsible Investment (UNPRI) signatories – up from only $4 trillion back in 2006. UNPRI signatories commit to integrate six principals covering environmental, social and governance issues into their investment decision making and ownership practices. Clearly, responsible investing is growing in importance – not only because it is good for our planet’s long-term prosperity but also because there is mounting evidence that it can lead to superior investment returns. For instance by subjecting equities from the high-carbon sectors in a given index to a performance test, related to normalised greenhouse gas emissions, and removing the ones with a below average performance relative to sector peers, it is possible to obtain a portfolio of securities with a lower carbon footprint while achieving superior total returns compared to the original index. In the simulated case below, the “Low Carbon US” achieves a 56.7 per cent reduction in normalized greenhouse gas emissions with the bonus of an extra 7.8 per cent in total returns compared to the original index over the time period January 1, 2008 to August 31 2014. The increased investor appetite for responsible investing has been made possible in part by the remarkable rise in the availability of sustainability data. Over the past decade, the number of corporate sustainability reports – the most common format for corporations to disclose their periodic environmental social and governance performance – has grown to 7,445 in 2013 from a mere 644 in 1999. A combination of heightened investor demand, activism and mostly regulatory intervention, coupled with a move towards greater transparency initiated by leading corporations, have all combined to drive increased sustainability disclosures. For instance, on October 17, 2014, the Singapore Stock Exchange announced its intention to adopt a comply-or-explain mechanism for sustainability reporting for all of its listed companies. When implemented, this piece of regulation will add to the inventory of close to 170 policies in force around the world that are meant to encourage or mandate corporate sustainability reporting. While the number of sustainability reports has increased substantially, a closer look reveals some important findings. 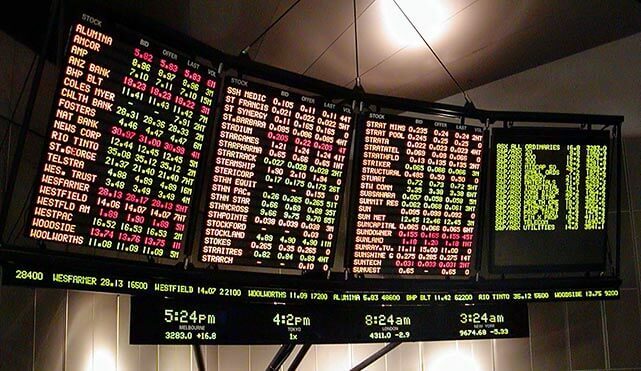 In its latest analysis of sustainability disclosure trends among the world’s stock exchanges, Corporate Knights Capital found that a sizeable chunk of the world’s large listed companies are failing to disclose their performance on the seven basic sustainability metrics – employee turnover, energy, greenhouse gas emissions (GHGs), injury rate, payroll (total employee compensation), waste and water. These seven basic indicators are objective measures of corporate sustainability performance that are broadly relevant for companies in all industries. Moreover, they are generally accepted as being the most widely tracked core sustainability metrics by various stakeholder groups including investors. For instance, only 39 per cent of the world’s 4,609 large listed companies disclosed their GHGs for the year 2012. For water, that percentage is 25 per cent. As for employee turnover rate, it is a paltry 12 per cent. 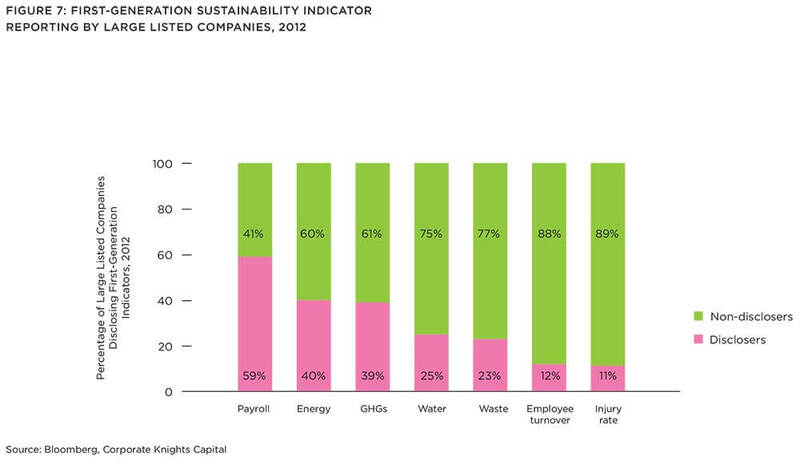 While disclosure rates vary by sector, it means that a majority of the world’s large companies are not still not disclosing these seven basic sustainability metrics – in the case of GHGs, arguably the most universally recognized strategic sustainability issue, it has not been reported by more than 61 per cent of the world’s large listed companies. Even more disconcerting is the finding that only 128 (2.8 per cent) of all of the world’s large listed companies disclosed all the seven basic sustainability metrics for the year 2012. Essentially, the remarkable rise in the number of sustainability reports has not been accompanied by a similar increase in the reporting of the basic sustainability metrics. Equally troubling is that disclosure rates on the seven basic sustainability indicators appear to be plateauing. As one illustration, the number of large listed companies that disclosed their energy use increased by 88 per cent from 2008 to 2012 but only by 5 per cent from 2011 to 2012. A similar reporting slowdown is occurring on the other six metrics. Clearly, a majority of companies are still not transparent enough to allow investors to make well-informed decisions over the long-term horizon by integrating foundational sustainability criteria. A point has been reached where virtually all the large companies that would have engaged in the reporting of the basic sustainability metrics have done so already and the remaining large companies likely have little or no intention of doing so under present circumstances. This is in stark contrast to investors’ growing interest in building sustainable investment strategies. Despite the notable progress made in corporate sustainability reporting, as shown above, there is still much room for improvement – not only in terms of quantity, but also in terms of consistency and timeliness. While virtually every company has reported on their financial performance six months after their year-end, only 63 per cent of these companies have disclosed their sustainability performance by then. It is therefore not a surprise that in October 2014, the UNPRI and Ceres’s Investor Network on Climate Risk (INCR) launched an initiative to convey investors demands for more timely comparable and material disclosure of corporate sustainability information to the International Organization of Securities Commissions (IOSCO) in order to inform their investment decisions. The IOSCO stands in a critical position in this regard through its direct relationship with member stock exchange regulators. Investors of all descriptions are encouraged to demand swift and decisive action from the IOSCO to provide greater clarity around sustainability reporting requirements, ideally to be integrated as part of existing financial disclosures. The necessary tools are already available. For instance, IOSCO can take inspiration from UNCTAD’s Best Practice Guidance for Policymakers and Stock Exchanges on Sustainability Reporting Initiatives to facilitate a consistent implementation of corporate sustainability reporting requirements among member exchanges. This guidance is a voluntary technical aid to assist stock exchanges and regulators who have responsibility for corporate reporting practice and are contemplating the introduction of a new imitative – or further development of an existing one – to promote corporate sustainability reporting. The relative success of the Johannesburg Stock Exchange in spurring sustainability disclosure amongst listed companies through the implementation of the listing requirement incorporating the King III Code of Corporate Governance stands as a benchmark for inspiring investors and stock exchanges around the world. Ceres’ Investor Listing Standards Proposal, Recommendations for Stock Exchange Requirements on Corporate Sustainability Reporting, which engages global stock exchanges via the World Federation of Exchanges (WFE) on a possible uniform reporting standard for sustainability reporting by WFE members may also serve as a basis for the implementation of corporate sustainability reporting requirements among member exchanges. Likewise, governments stand in a pivotal position to influence corporate sustainability reporting and are encouraged to renew their efforts in this direction. Existing policies around the world vary in many respects in terms of whether they are mandatory or voluntary, broad or narrow (i.e., applies to various industries as opposed to only one or a few specific industries) and prescriptive or principles-based (i.e., states which specific items of sustainability performance metrics are to be reported and how). 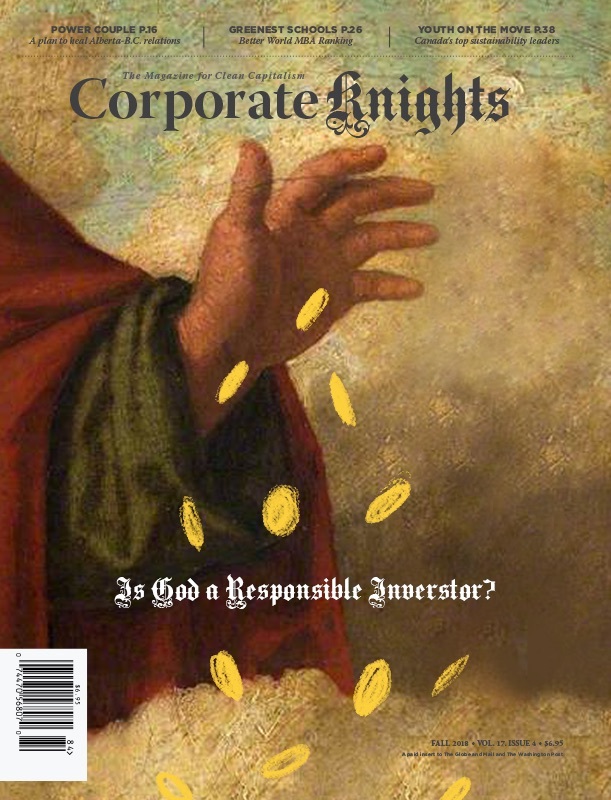 These wide differences in the type of policies may, in part, explain the differences in disclosure performance by the large listed companies of the seven basic sustainability metrics among the world’s stock exchanges, as shown in Corporate Knights Capital’s latest report on corporate sustainability disclosure trends. However, it was found that there is a strong association between policies that are mandatory, broad and prescriptive and better corporate sustainability disclosure performance. Policy-makers may use this finding as a framework to identify case studies as a framework to identify case studies and benchmarks for implementation in their own jurisdictions. The advent of non-governmental standard-setters such as the Global Reporting Initiative (GRI), the Sustainability Accounting Standards Board (SASB) and voluntary disclosure frameworks, such as the CDP and the Climate Change Reporting Framework, have without a doubt, helped to popularize sustainability reporting. However, there exists a proliferation of fragmented and often competing reporting standards and frameworks when it comes to sustainability reporting that may bring confusion to both the reporters and the users. A rapid and successful conclusion of the work among the participants to the Corporate Reporting Dialogue will bring about much needed clarity and comparability in corporate sustainability reporting, which will encourage more corporations to embrace more coherent and useful disclosures of sustainability performance. The Corporate Reporting Dialogue brings together financial reporting standard-setters and sustainability reporting frameworks to promote greater alignment, consistency and comparability between corporate reporting requirements, standards and frameworks. An endorsement by the major groups of users of corporate disclosures – both financial and non-financial – of the outcome of the work of the Corporate Reporting Dialogue will also help in determining the de facto global standard in corporate reporting. The explosion in corporate sustainability reporting over the last 10 years or so has certainly helped to fuel the remarkable rise in responsible investing. Responsible investing is a much heralded practice whereby investment decisions consider long-term economic, social and environmental sustainability. However, current corporate sustainability reporting practices are at odds with the needs and level of interest from investors, such that a renewed effort is needed to bring sustainability reporting to the next level. Governments, regulators both public and private, business and non-business organizations, and investors all have an important role to play to make this happen.